From out of his knapsack he took a fine fiddle. And he played her such merry tunes that you ever did hear. And he played her such merry tunes that the valley did ring. Oh soldier, oh soldier, will you marry me? Oh no said the soldier, that can never be. For I have my own wife at home in my own counteree. And she is the sweetest little thing that you ever did see. Now I´m off to India for seven long years. Drinking wines and strong whiskey instead of cool beers. And if ever I return again it will be in the spring. And we´ll both sit down together love to hear the nightingale sing. 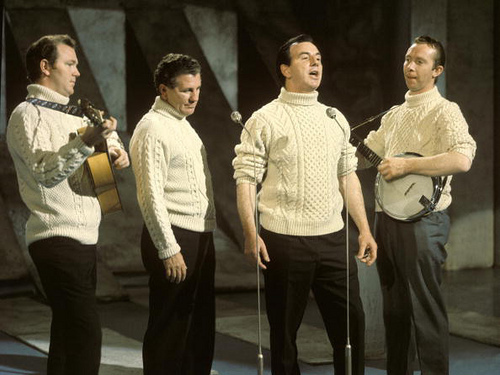 The Clancy Brothers were an influential Irish folk music singing group, most popular in the 1960s, who are often credited with popularizing Irish traditional music in the United States. The brothers were Patrick "Paddy" Clancy, Tom Clancy, Bobby Clancy and Liam Clancy. They are best known for their work with Tommy Makem, recording dozens of albums together as The Clancy Brothers and Tommy Makem. They were a primary influence on a young Bob Dylan and on many other emerging artists.